Stephanie Bonetta is the goddess behind her gluten-free gourmet goodness! A teacher who had a yummy flash of genius in her parents' kitchen decided to ditch school to make granola, trail mix and truffles instead. Here's her story and perspective on living a healthy hip and urban life. What inspired you to start a gluten-free gourmet company? I wanted to combine my passion for natural, healthy, whole food plant-based eating and use my creative “girlness” to show people that healthy eating can be full of taste and superfoods are gourmet! I also want to take my company and develop it into a holistic healthy lifestyle brand where my team and I will develop not only healthy allergen free food but make up too! We would also give cooking demos and tips, healthy lifestyle consultations and who knows even clothing, shoes and a guide/recipe book to top it off! What is a typical day in the life of Stephanie Bonetta? First of all, there is no typical day in my life and there never has been! Every day is different and an adventure because my brain is always buzzing and I’m constantly thinking of ideas on new recipes, new healthier ingredients, new product, marketing, sales targets and target retailers. I have made it a habit to calm the mind by doing various types of yoga 3-4 times a week, I do cardio and circuit training also at my gym. I also plan and make my vegan, raw meals for the week so I can get all the nutrients, enzymes, antioxidants and pure energy I need to function in this highly demanding and competitive food industry. I am now taking my Holistic Nutrition Certification at Instutite of Holistic Nutrition Mississauga Campus so every Monday and Thursday evening I drive almost 200kms and am immersed in my passion for healthy eating for 8 hours a week which just fly by! On top of running my business, keeping fit and healthy and taking night school. I also supply teach at various high schools in Niagara Region to help with day to day living expenses! Trying to make super nutritious snacks at affordable consumer prices and not having enough time for my personal/social life as I would like. 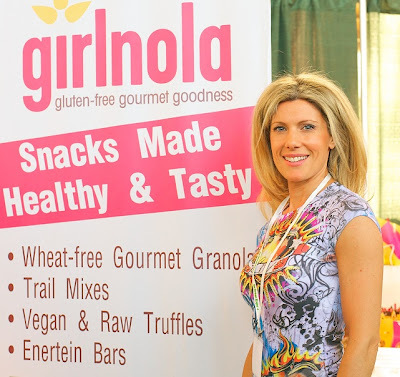 Tell us more about Girlnola! For now the line has three types of gluten-free, vegan organic granola – Gojinana (most popular) has gojiberries, cashews, banana and large flaked coconut, Berrynana has blueberries, cranberries, gojiberries and banana and Chocoberry (my favourite) has 70% dark chocolate, cacao nibs, cranberries and almonds. We also have three types of organic, vegan, gluten-free energy truffles almondkiss, cloudnine and a third that I can’t think of a name for yet. This one has acai berry and cherries in it! We also have our raw, organic trail mixes which include a roasted chickpea (nut-free), cashew + berries and chocolate almond cranberry (again my fave!). We are working on a granola cookie/bar mix that you can make at home with a raw and baked version of recipes on the back of the bag, gluten-free gourmet bread crumbs, croutons and even a vegan, organic and nutritious pink lip gloss! What did you study in University/College? Would you have done anything differently? I studied second language teaching and am a certified high school French and Italian teacher. I took extra courses while teaching full-time and am also qualified to teach religion, cosmetology, technology and cooperative education! I feel fortunate and thank my parents for having encouraged me to pursue a university degree so I would not change anything because the past is unchangeable so I focus on the present and I set two types of short-term and long-term goals: one set that is achievable and another that might not be realistically achievable but help me dream and push me to find solutions to make them achievable. Favourite places to shop in the city? Who has time for shopping now?! 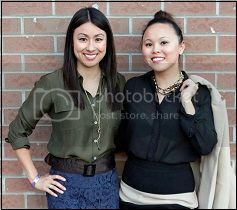 I love boutique shops for anything locally made or made in Canada. I tend to shop at casual trendy boutiques for clothing and accessories and LOVE anything to do with organic/eco-friendly make-up and hair products. Tell us about your neighbourhoods and what you like best about it. I live in the country, in Niagara-on-the-Lake and I love the peace, clean air and looking out my window and seeing an abundance of lush nature. I also love being woken-up around 5:30am by the chirping birds! Having said this, I do miss my old neighbourhood in Liberty Village and what I liked best about that area of Toronto was the most unique cafés, restaurants, boutiques and hip young crowd! What do you wish someone told you when you were younger and just starting out? People gave me lots of advice and wise bits of information, I listened but didn’t necessarily do them! My friends and family always told me to go with my passion and take the leap of faith yet my business colleagues always reminded me to write a business plan, do market research and borrow money (never use your own!). What advice do you have for hip + urban girls to live a healthier lifestyle? Make sure you nourish your spirit by doing some form of yoga, nourish your mind by reading lots and interacting with different people from all walks of life, nourish your body by eating 80% whole food plant-based diet and 20% other food and nourish your heart by experiencing love for someone and a passion for what will drive you to be successful.